Leftovers; why do some people cringe at that word? It’s actually a great problem to have, you know. Some of my most incredible creations have come from leftovers. And when I’m too lazy to cook? Yep, it’s leftovers to the rescue there, too. I used to buy something like celeriac or a bunch of dill for a recipe and wouldn’t know what do with what I had left. Good food would sit in the fridge until it went bad, or parts of the food that I didn’t know were edible were thrown away. It’s funny that I buy so much more produce than I ever used to, and seldom do I have to throw any of it out. I’ve gotten good at minimizing food waste, but it didn’t happen overnight. I’ve learned a lot from watching cooking shows and reading about different foods online. When food in my kitchen spoils, I know that either I got produce-happy and bought too much (less likely), or (more likely) that I’m not eating as well as I should be. My former self would have likely let some of today’s ingredients go to waste for sure. Lucky for you all, I’ve gotten more crafty over the years. I came up with this recipe, a warming grain dish with plenty of tang and a sweet finish from the golden raisins. Recently, I made chermoula for the first time. Even though I made it along with another dip for kohlrabi fries, I kind of mostly (ok, completely) made it because it looked like such a dynamite recipe. It yielded two cups–way more than I needed, so I was trying to think of something fun to do with it. Since I was spending the weekend away from home and wanted the sauce to stay as fresh as possible, I froze most of the chermoula in ice cube trays. Freeze leftover sauces (like chermoula or pesto) in ice cube trays to maintain optimum freshness and portion them into convenient individual serving sizes. Once frozen, store them in a baggie or container. 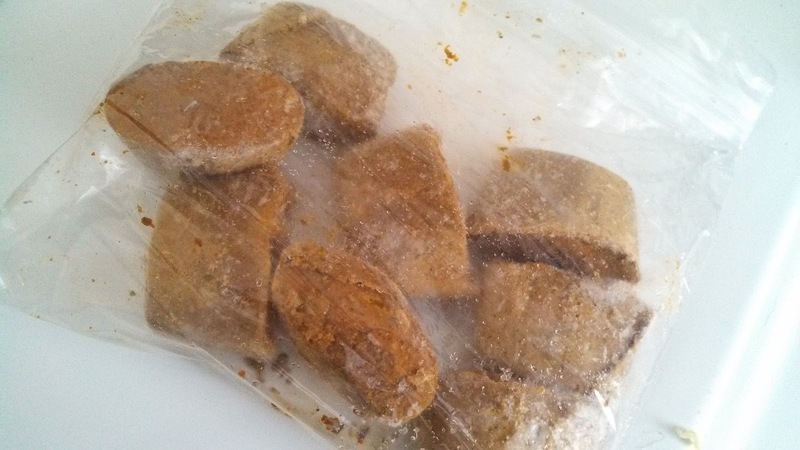 Other ideas of things to freeze in ice cube trays include vegetable stock for soup or sauteed vegetables and coconut water or pureed fruit for smoothies. -Divide the chermoula in half. One half is for the vegetables, one half for the tofu. -Press the tofu and then cut into 4 pieces. Arrange on a small baking sheet and cover the tofu with the chermoula. Flip the tofu to coat the other side in sauce as well. 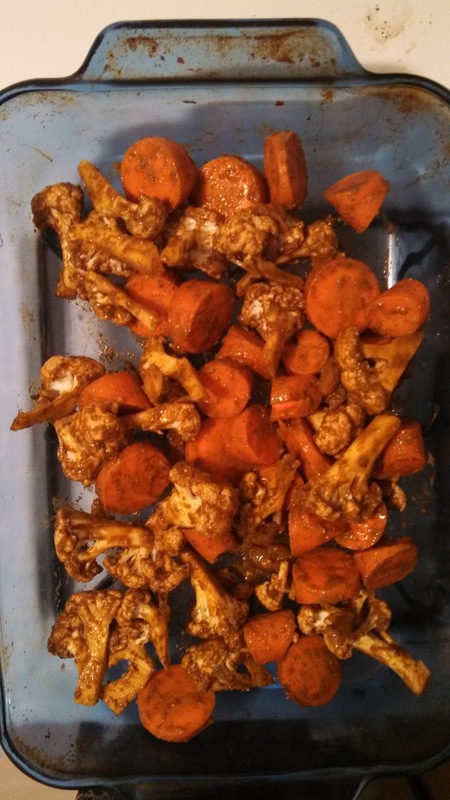 -In a baking dish, toss carrots, cauliflower, and raisins in the other half of the chermoula. -Cook vegetables at 350 for 35 minutes or until soft but still a bit firm. -Cook tofu at 350 for 20 minutes on one side, flip and cook for 15 minutes more. 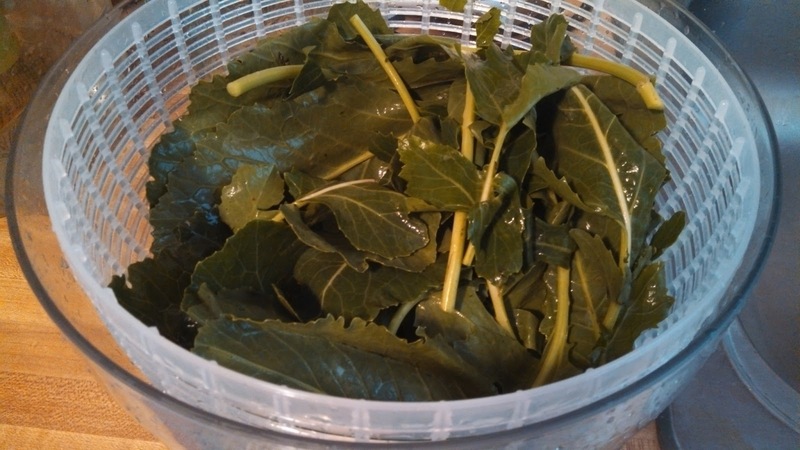 -While the vegetables are roasting, combine quinoa, greens, and broth in a saucepan. Cover and cook for 5-10 minutes on low-medium heat until greens are wilted and quinoa is heated through. 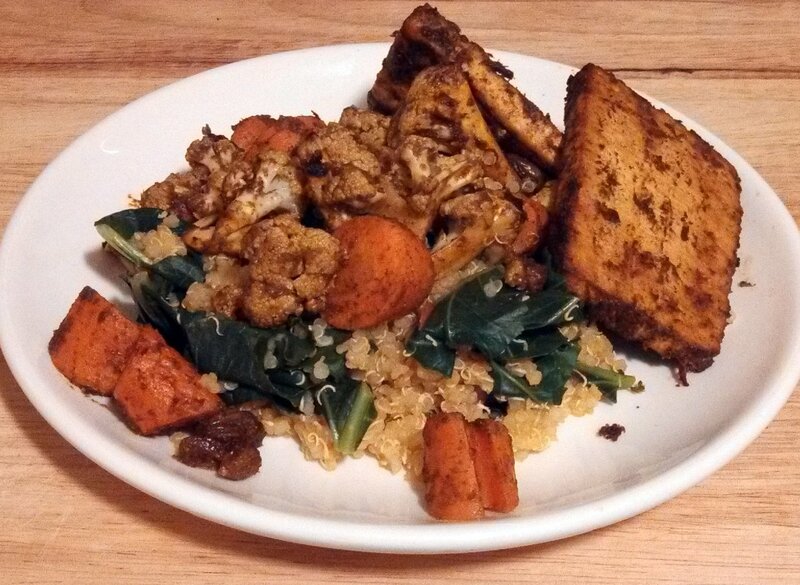 -To plate, scoop a generous mound of quinoa onto the plate and top with the roasted vegetables and tofu. Garnish with parsley or cilantro.